Representing Dylan's migration from acoustic Folk to electric Rock, this album includes songs from both worlds with an acoustic and an electric side. 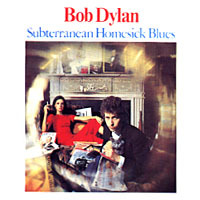 It became Dylan's first album to break into the US Billboard Top 10 at #6 and "Subterranean Homesick Blues" became his first single to chart in the US. The album has been released in Europe as "Subterranean Homesick Blues". Re-released in 2003 on a remastered Hybrid Stereo SACD with surround mix.